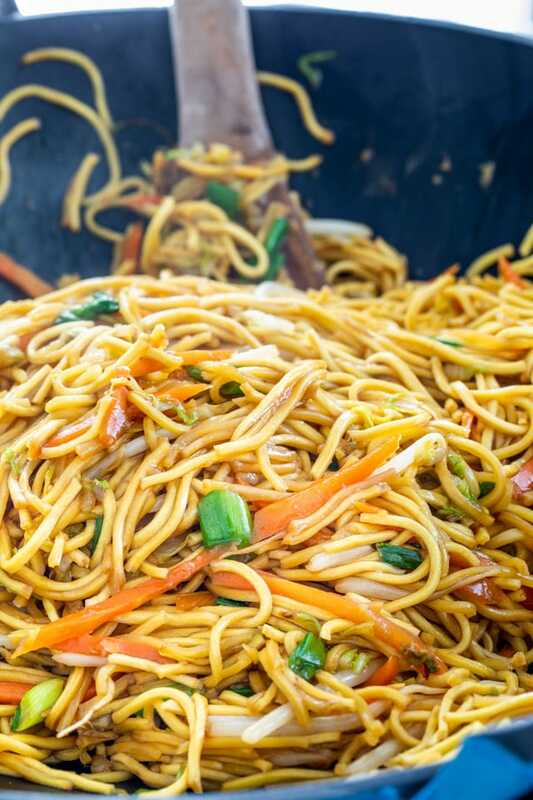 Delicious Chow Mein ready in just 15 minutes, easy to put together, all in one pot and always a crowd favorite! A homemade version of your favorite take-out dish, vegetarian style or add the protein of your choice! This really is one of my favorite take-out dishes ever. But did you know it’s so simple to make at home that you can really make this from start to finish in 15 minutes? Yep, that’s faster than it would take you to order take-out! 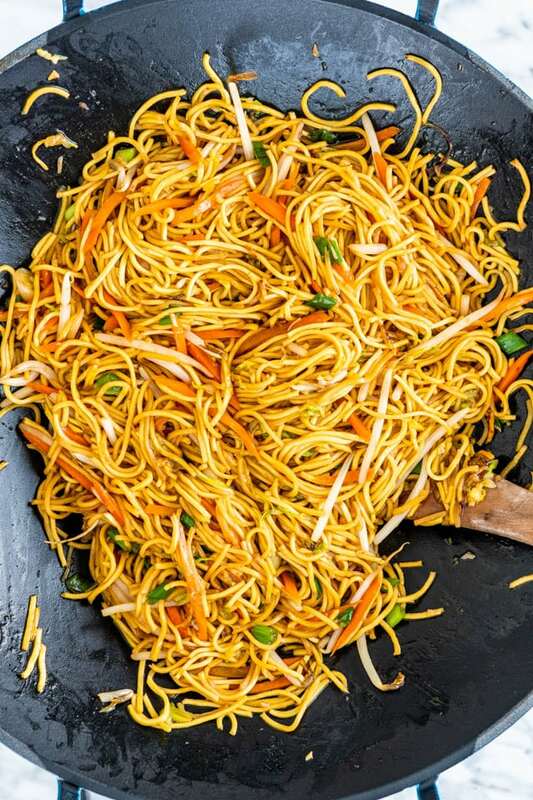 Not only is this recipe quick, but you really do end up with restaurant quality Chow Mein. This will surely become your family’s favorite! The other great thing about this dish is that it’s easily customizable! Chow Mein is a Chinese dish of stir fried noodles with vegetables and sometimes shredded meat like chicken, beef, pork or seafood. The words chow mein really just mean “stir fried noodles”. Let me first say that I love both Chow Mein and Lo Mein, they are a couple of my favorites whenever I go to a Chinese buffet. However, if you’re really wondering what the difference is between the two, let me just say not a lot. The main difference is in the method and it comes down to frying time. 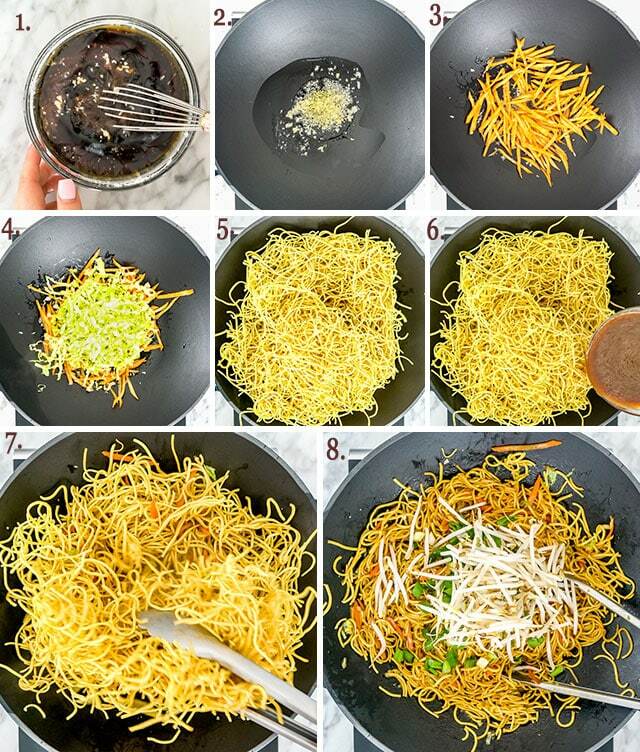 Chow Mein usually has crisper noodles, so you add a bit more oil and increase the frying time. 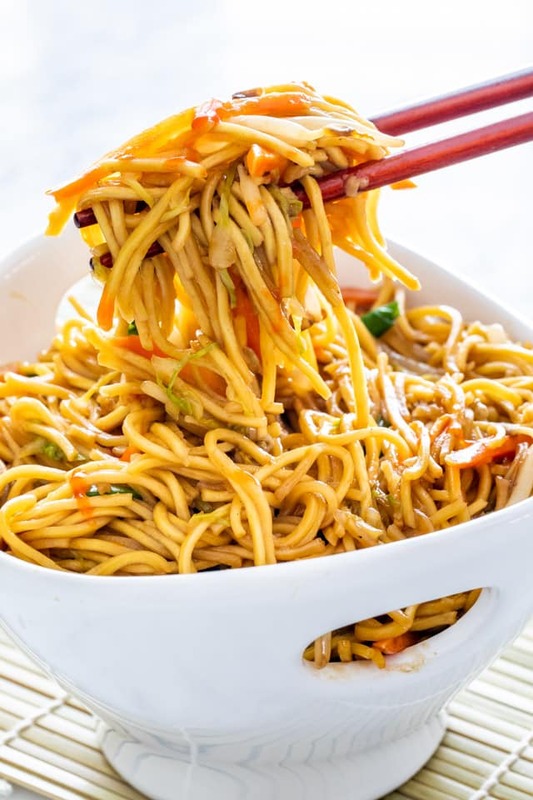 Both Chow Mein and Lo Mein are made with Chinese wheat flour noodles made with eggs. 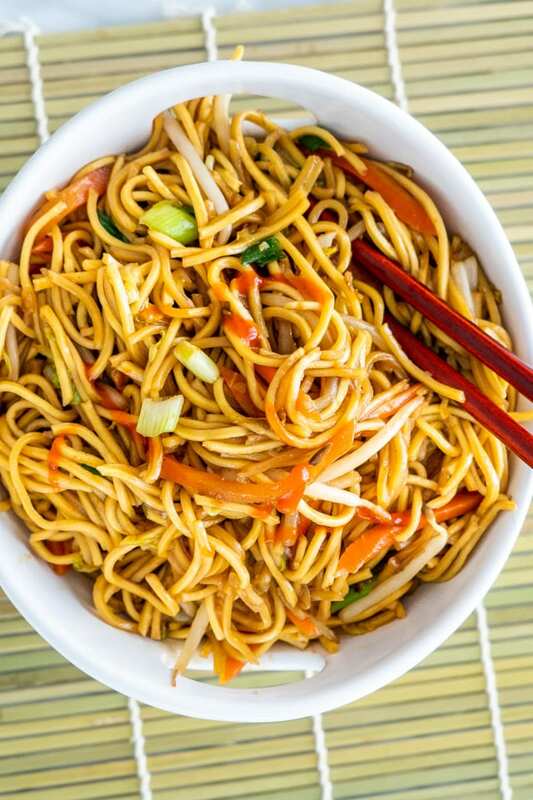 For Chow Mein you can use either dried or fresh noodles, while for Lo Mein you use fresh noodles. That’s about it! Which is better? It all comes down to your preference! Oyster Sauce – a sauce made with oysters and soy sauce, very common in Chinese cooking. Chinese cooking wine – a rice wine that is commonly used in Chinese cooking. Rice wine is made from fermented glutinous rice, where the sugars are transformed into alcohol by yeast. It’s usually used to tenderize meat and seafood as well as add flavor to food. Dark Soy Sauce – it’s usually thicker and darker in color, and aged for a longer period of time. It’s made from molasses or caramel and a bit of cornstarch. It has a more full-bodied flavor and it’s usually used to add flavor and a darker color to food. If you’ve had chow mein before then you know it comes with crispy noodles or non crispy noodles. For the crispy version you usually deep fry the noodles until they’re crispy. I, however, prefer the non crispy version. The other difference with my recipe is in how the noodles are prepared. Usually the noodles are soaked in boiling water until soft. However, I prefer to add mine to wok dry and then just pour the sauce over them. This way it’s all done in one pot, I hate washing pots. As you start tossing the noodles around, you’ll notice them soften and within a few minutes they will be cooked enough. To do this, start by mixing all the sauce ingredients together in a bowl and set aside. Saute the garlic in the peanut oil for just 30 seconds until it becomes aromatic. Add in the carrots and cook for a minute or so until they soften a bit then add in the cabbage. Stir-fry the cabbage and the carrots for 2 to 3 minutes in total. You’ll notice the cabbage start to wilt a little. Add the noodles to the wok, give the sauce another stir since the cornstarch tends to sink to the bottom, then pour it over the noodles. Leave them alone for 2 minutes, then start tossing them around, you’ll notice they soften quickly and within a couple minutes they’re all done. Add the bean sprouts and green onions and serve while warm. I like to drizzle some hot sauce over mine, for a little kick. Trust me, it’s worth it! Prepare all your ingredients ahead of time. Whisk all the sauce ingredients together and chop all your veggies. Once you start making this dish, it’s super quick and you’ll be done in no time! 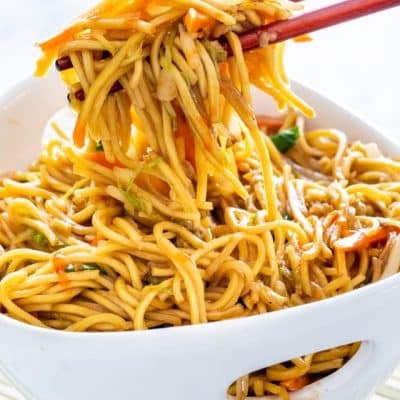 If you can’t find chow mein noodles use other noodles such as soba noodles, or pancit noodles, I find they work the best. If you’re adding a protein such as chicken or beef to this dish, add them to the wok first and saute them until no longer pink. If you don’t have a great big wok, just use a large skillet, it works just fine. If you’ve got some leftovers, store them in an airtight container in the refrigerator for 3 to 4 days. Usually I just reheat it in the microwave for a couple minutes before serving again. You can freeze chow mein, stored in an airtight container in the refrigerator for 2 to 3 months. 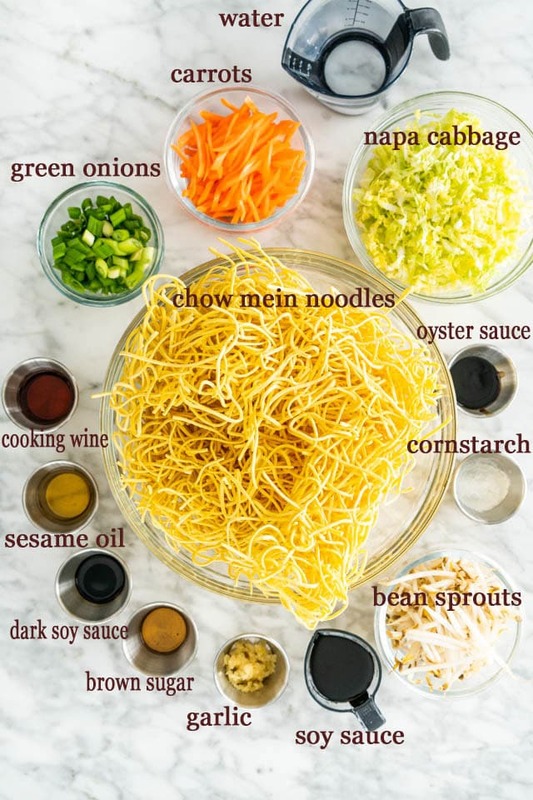 Make chow mein sauce: In a medium size bowl whisk all the sauce ingredients together and set aside. Stir-fry veggies: In a wok or a large skillet or frying pan heat the peanut oil. Add the garlic and saute for 30 seconds. Stir in the carrots and cook for another minute until they start to soften a bit. Stir in the cabbage and saute for 2 more minutes until the cabbage is wilted. Add noodles and sauce: Add the noodles to the wok. Give the sauce a quick stir, then pour over the noodles. Let them cook for 2 minutes before tossing them around in the sauce. Keep tossing them around and within 3 to 5 minutes they will soften and cook completely. Add the green onions and bean sprouts: Add in the green onions and bean sprouts and toss everything together. Serve: Serve while warm. If preferred drizzle some hot sauce over the noodles. Protein: Feel free to add protein of your choice to this dish, such as chicken, pork, beef or shrimp. If adding protein, I recommend sautéing it first in the wok with a bit of oil before adding any of the veggies to the wok. Chinese cooking wine: If you want an alcohol free version, go ahead and use a vegetable broth or chicken broth instead, though the cooking wine really is key to this dish. Where do you find Chinese noodles?? Any Asian market will have them! I’ve seen them in the ethnic aisle at many grocery stores as well.